As a major supplier of quality networking equipment to Tier-1 vendors worldwide, Accton’s manufacturing facilities are recognized as meeting rigorous quality standards, including those for safety, durability, and reliability. In addition, Accton not only provides quality manufacturing, but also a flexible supply chain and responsive services for its customers. Even with its strong emphasis on quality at all stages of product development and manufacturing, Accton continues to improve all processes that deliver quality beyond customer’s expectations. In fact, Accton can boast of being an industry leader in low defects and mean time between failure (MTBF) rates. Accton is committed to a full implementation of Total Quality Management (TQM) and Total Quality Assurance (TQA) that is rigorously applied through product design, development, manufacturing, and support. 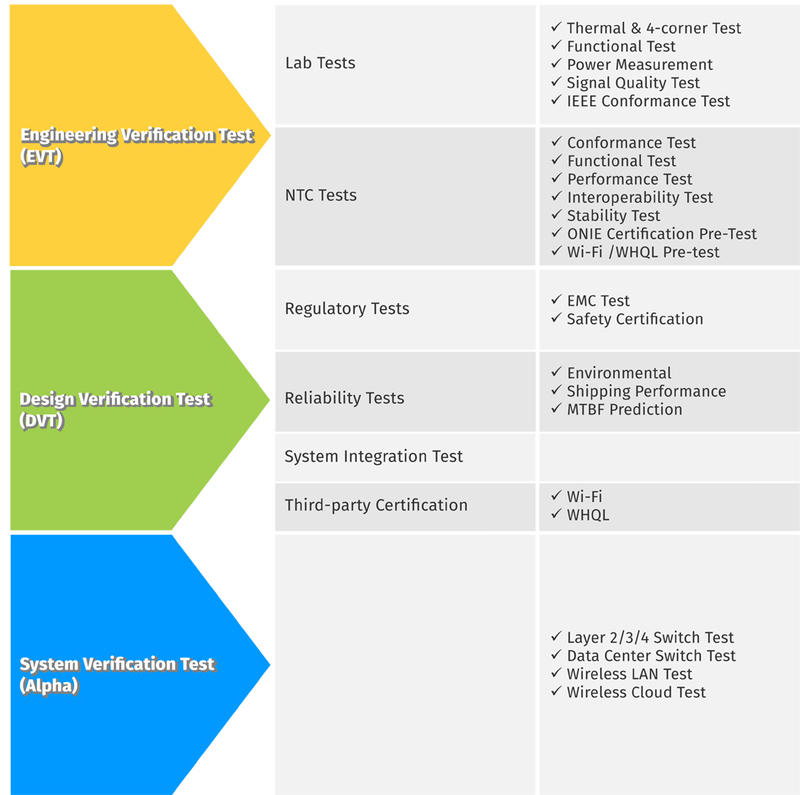 All products must pass Accton’s three major test phases of the product development process, as follows. The Joytech site includes a strong team of manufacturing engineers with extensive experience in ODM manufacturing, more than 1800 employees work at JoyTech. The whole site comprises more than 71,400 square meters of floor space with 18 SMT lines. The production facilities include lean-line and RoHS production processes, and by leveraging long-term partnership electronics manufacturing services (EMS), Joytech can provide a flexible production capacity.